The NFL provides seed money for building a youth center in past host cities. But the local Super Bowl Committee’s visionary leaders wanted to do things the “Indianapolis Way,” to dream bigger and promise to do something no host city has done before: partner alongside a neighborhood already in the midst of transforming their own community. 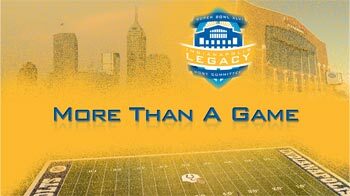 More Than a Game: The Indy Super Bowl Legacy is a half-hour program chronicling the impact of the upcoming Super Bowl on the city, focusing on a section of Indianapolis that is undergoing profound change.